The Tuesday Bird Walk went to Columbia Beach. Eighteen birders saw and heard forty-four species of birds. spotted a Merlin attempt to catch a small bird. 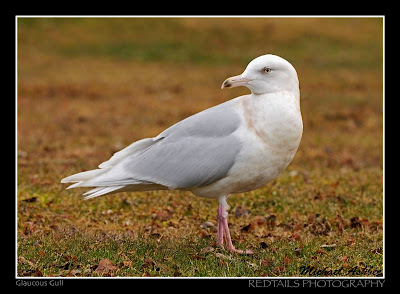 A Glaucous Gull has been seen since Friday February 20 and is still at Parksville Community Park in Parksville Bay. The Gull is in with the flock of Gulls near the Vollyball sand courts on the grass area. Brant Geese in flight: Ralph Hocken Photo. Parksville. Among the highlights was the sighting of a Peregrine Falcon perched on a stump for the whole morning and four flocks of Brant Geese flying low over the water. We saw many flocks of Common Murre, Surf Scoters and White-winged Scoters heading down the Strait of Georgia. Rafts of Red-breasted Mergangers, along with Pacific Loons and Common Loons, were spotted not far off shore. Canada Goose, Brant Geese, American Wigeon, Mallard, Northern Pintail, Green-winged Teal, Surf Scoter, White-winged Scoter, Bufflehead, Greater Scaup, Harlequin Duck, Long-tailed Duck, Common Goldeneye, Barrow's Goldeneye, Red-breasted Merganser, Common Merganser, Pacific Loon, Common Loon, Common Murre, Bald Eagle, Cooper's Hawk, Peregrine Falcon, Killdeer, Black Turnstone, Glaucous-winged Gull, Belted Kingfisher, Northern Flicker, Pileated Woodpecker, Steller's Jay, Northwestern Crow, Common Raven, Chestnut-backed Chickadee, Brown Creeper, Golden-crowned Kinglet, American Robin, Varied Thrush, European Starling, Spotted Towhee, Fox Sparrow, Song Sparrow, Golden-crowned Sparrow, White-crowned Sparrow, Red-winged Blackbird, Brewer's Blackbird, Purple Finch, Dark-eyed Junco, Pine Siskin and House Finch. A Cinnamon Teal and a Snow Goose were seen at Somanos Marsh in Duncan. A large flock of Cedar Waxwings were spotted at Buttertubs Marsh in Nanaimo. One Herring Gull, three Western Gulls, one Glaucous Gull. several Thayer's Gulls and about three hundred Glaucous-winged Gulls were seen at the Parksville Community Park at Parksville Bay. "Rare bird alert-Northern Hawk Owl"
The Northern Hawk Owl was seen today along Morden Road in south Nanaimo. Three Turkey Vultures were seen riding the thermals over Copley Ridge in Upper Lantzville. Hutton's Vireo hawking insects from a snag. Ten Golden-crowned Sparrows were spotted feeding on the ground near a short bush. Large flocks of singing House Finches kept us entertained throughout the morning. We spotted a Cooper's Hawk perched high up in a large bush. Two Bald Eagles spent the morning looking over the Bay from high atop a Fir Tree. On the way back to Parksville, we spotted two Pigeon Guillemots at Nile Creek. Brandt's Cormorant, Double-crested Cormorant, Pelagic Cormorant, Great Blue Heron, Bald Eagle, Cooper's Hawk, Black-bellied Plover, Black Oystercatcher, Black Turnstone, Mew Gull, California Gull, Thayer's Gull, Glaucous-winged Gull, Pigeon Guillemot, Rock Pigeon, Hutton's Vireo, Northwestern Crow, Chestnut-backed Chickadee, American Robin, European Starling, Spotted Towhee, Song Sparrow, Golden-crowned Sparrow, Dark-eyed Junco, House Finch, Pine Siskin and House Sparrow. A Ring-necked Pheasant was seen in a yard in the Eaglecrest area of Qualicum Beach. 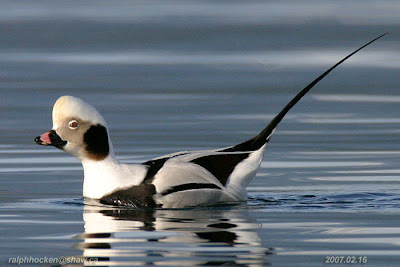 A Townsend Warbler was seen in bushes and Brant Geese were seen on the water near Beach Club Resort in Parksville. Cooper's Hawk, an Evening Grosbeak, Pine Siskins, a Pileated Woodpecker and Song Sparrows are visiting a backyard along Doehle Avenue in Parksville. A Pine Grosbeak was feeding on berries on a Arbutus tree in the 900 block of Nanaimo River Road in Nanaimo. Monday February 23, 2009 @ 7:30 pm. Guest Speaker Pamela Wesley will speak about the invasive plant situation on the Island. The Tuesday Bird Walk on February 24 , 2009 will be going to Columbia Beach. Playground at 9:00 A.M. Or meet at the parking area off Admiral Tylon Boulevard ( Turn onto Columbia Drive off highway 19a go to Admiral Tylon Boulevard turn right and go about 100 meters and turn left onto a parking area near the ocean) at about 9:15A.M. The Sunday Bird Walk on March 01, 2009, will be going to Buttertubs Marsh in Nanaimo. Meet at the Bird Store at 9:00 A.M. or meet at the Butterubs parking area off Bowen Road at about 9:15 A.M.
lden-crowned Sparrows were spotted feeding on the ground near a short bush. Large flocks of singing House Finches kept us entertained throughout the morning. We spotted a Cooper's Hawk perched high up in a large bush. Two Bald Eagles spent the morning looking over the Bay from high atop a Fir Tree. On the way back to Parksville, we spotted two Pigeon Guillemots at Nile Creek. The Sunday Bird Walk went to the Nanaimo River Estuary on a very windy but clear sunny morning. The highlights of the morning included the sighting of both a male and female Northern Harrier flying low over the field looking for prey. The female Northern Harrier flushed out two Western Meadowlarks, who land in a tree and perched to allow us to have some great looks through the spotting scopes. At the far end of the estuary we spotted a total of twenty-nine Great Blue Herons standing like fence posts in a field. Canada Goose, Trumpeter Swan, American Wigeon, Mallard, Northern Pintail, Green-winged Teal, Greater Scaup, Bufflehead, Barrow's Goldeneye, Common Goldeneye, Common Merganser, Great Blue Heron, Bald Eagle, Northern Harrier, Red-tailed Hawk, Glaucous-winged Gull, Northern Flicker, Northwestern Crow, Common Raven, Steller's Jay, American Robin, Western Meadowlark, Bewick's Wren, Spotted Towhee, Song Sparrow, Dark-eyed Junco and Golden-crowned Sparrow. "Rare bird alert--Northern Hawk Owl"
The Northern Hawk Owl was seen off Morden Road in south Nanaimo. Friday February 13:Twelve House Finches were seen on the trees beside Cedar Road near Hill Road in Ladysmith. Twenty-seven California Quail were visiting a back yard in the 2100 block of Wren Road in Nanaimo. Two Western Gulls were seen on the High School playing fields in Duncan. Four Varied Thrush, twelve Dark-eyed Juncos, three Chestnut-backed Chickadees, one Hutton's Vireo, one Bewick's Wren, two Red-breasted Nuthatches, one Brown Creeper, two Northern Flicker, one Spotted Towhee, two House Finches, one Anna's Hummingbird and a Downy Woodpecker are visiting a backyard along Jade Avenue in Nanaimo. A Silver Pheasant was spotted near Linley Valley in Nanaimo.
" Rare bird alert--Great Gray Owl"
A Great Gray Owl was seen on Quadra Island. This species of owl is usually seen in Northern Canada and rarely seen on Vancouver Island. The Tuesday Bird Walk went to Rathtrevor Provincial Park in Parksville. Twelve hardy birders saw and heard seventeen species of birds. The winds were strong from the southeast and seas were rough with heavy pounding surf and the blustery rain and snow followed us all morning. It was an awesome scene seeing the sea in it's dark winter stormy mode. 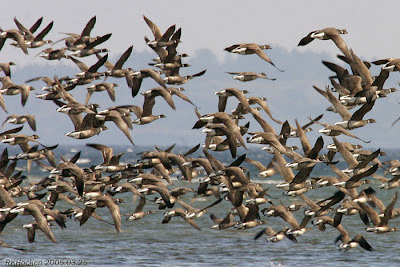 The big surprise of the morning was the sighting of a flock of over two hundred Brant Geese flying near the shore. A large flock of Dunlin and Black-bellied Plovers were feeding along the tide line and we spotted an American Golden Plover feeding in with the Black-bellied Plovers. 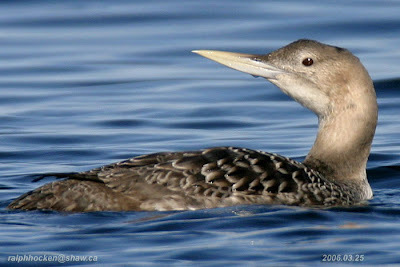 A Common Loon and a Yellow-billed Loon were riding the surf offshore. Long lines of Surf Scoters and American Wigeon flew just above the water heading down the Strait of Georgia. We spotted a Brown Creeper feeding as it climbed a big Fir Tree. A fast flying Red-tailed Hawk flew over us heading south. Thayer's Gull, Glaucous-winged Gull and Brown Creeper. 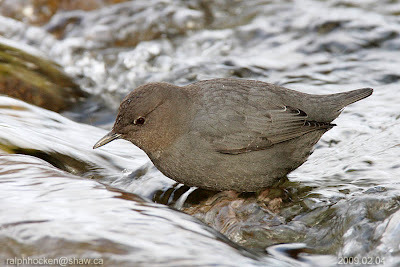 Two American Dippers were spotted just downstream of the Englishman River bridge in Parksville. The Tuesday Bird Walk on February 17, 2009 will be going to Deep Bay. Playground at 9:00 A.M. Or meet at the parking area at the Deep Bay Marina at about 9:30 A.M. The Sunday Bird Walk on February 22, 2009, will be going to the Plummer Road side of the Englishman River Estuary in Parksville. Meet at the Bird Store at 9:00 A.M. or meet at the corner of Plummer Road and Shorewood Drive at about 9:30 A.M.
Twelve hardy birders saw and heard seventeen species of birds. 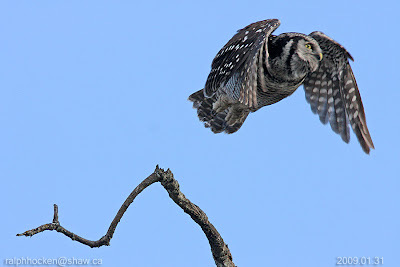 Northern Hawk Owl along Morden Road: Ralph Hocken Photo.
" Rare bird alert--Northern Hawk Owl"
The Northern Hawk Owl along the Morden Road in south Nanaimo has been seen everyday since Saturday January 24, 2009 and is still in this same area today. The owl is a rare sighting on Vancouver Island, however it can be seen east and north of the interior of British Columbia, as well as across the rest of Canada. The Sunday Bird Walk went to Nanoose Bay. On a very calm but overcast morning ten birders found the following thirty-four species of birds: Canada Geese, American Wigeon, Horned Grebe, Pelagic Cormorant, Green-winged Teal, Mallard, Northern Pintail, Bufflehead, Barrow's Goldeneye, Red-breasted Merganser, Common Loon, Great Blue Heron, Bald Eagle, Red-tailed Hawk, Mew Gull, Glaucous-winged Gull, Thayer's Gull, Northern Flicker, Northwestern Crow, Common Raven, Steller's Jay, American Robin, European Starling, Red-wing Blackbird, Chestnut-backed Chickadee, Bewick's Wren, Golden-crowned Sparrow, White-crown Sparrow, Dark-eyed Junco, Spotted Towhee, House Finch, Song Sparrow, Purple Finch, and Pine Siskin. A low flying Peregrine Falcon flew over the Backyard Wildbird and Nature Store in Nanaimo this morning. A Barred Owl was perched in a California Red Cedar tree in a garden in the 400 block of Stewart Avenue in Nanaimo. A Northern Harrier was seen over Woodthrush Place in Nanaimo. Six Evening Grosbeaks, Northern Flickers, Pileated Woodpeckers, Hairy Woodpecker, Steller's Jays, Bushtits, Pine Siskins, California Quail, Varied Thrushes, Chestnut-backed Chickadees, Spotted Towhees, Dark-eyed Juncos, Red-breasted Nuthatches, House Finches and a Coopers Hawk have been visiting a backyard in the Falcon Court area of Aerie Estates in French Creek. Two Great-horned Owls were seen along Morrell Circle in Nanaimo. A Northern Harrier, a Merlin and a Short-eared Owl were spotted at the Nanaimo River Estuary in south Nanaimo. The Tuesday Bird Walk went to the Shelly Road side of the Englishman River Estuary in Parksville. Thirteen birders saw and heard forty-nine species of birds. The winds and seas were calm and the sun was shinning. It was a great day to be birding! 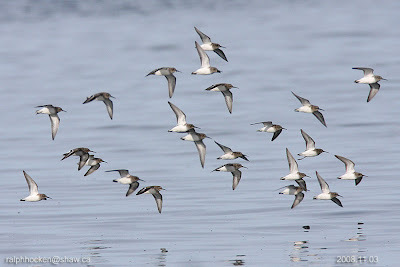 The highlights of the morning included the sighting of a flock of five hundred Dunlin and a small flock of Black-bellied Plovers flying down the Strait of Georgia. An Eurasian Wigeon was spotted among the American Widgeons that were feeding near the shoreline, two Gadwall in the estuary swam slowly away from us. We heard two Pileated Woodpecker calling close by and then we watched as they flew over the river giving us a quick view. We saw a Bewick's Wren and a Fox Sparrow in a low bush near the viewing tower. A Cooper's Hawk was perched in a low bush and there were Golden-crowned Sparrows in the nearby bushes. Two flocks of busy Bushtits and a flock of Golden-crowned Kinglets flew by us in some low bushes next to the trail. We saw a large number of Bald Eagles and Northern Flickers perched in the trees throughout the walk. Mew Gull, Thayer's Gull, Glaucous-winged Gull, Belted Kingfisher, Downy Woodpecker, Northern Flicker, Pileated Woodpecker, Steller's Jay, Northwestern Crow, Common Raven, Chestnut-backed Chickadee, Bushtit, Red-breasted Nuthatch, Bewick's Wren, Winter Wren, Golden-crowned Kinglet, American Robin, Varied Thrush, European Starling, Spotted Towhee, Fox Sparrow, Song Sparrow, Golden-crowned Sparrow, Dark-eyed Junco and House Finch. Over twenty Bushtits were visiting suet feeders near Wild Place near Buttertubs Marsh in Nanaimo. Guest speaker Gary Kaiser will present a programme on the Marbled Murrelet. Playground at 9:00 A.M. Or meet at the main parking lot (the last parking lot before the campground) at Rathtrevor Provincial Park at about 9:15 A.M.
"Please note there is a parking fee at Rathtrevor." The Sunday Bird Walk on February 15, 2009, will be going to the Nanaimo River Estuary in south Nanaimo. Meet at the Bird Store at 9:00 A.M. or meet at the end of Raines Road at about 9:30 A.M. The highlights of the morning included the sighting of a flock of five hundred Dunlin and a small flock of Black-bellied Plovers flying down the Strait of Georgia. An Eurasian Wigeon was spotted among the American Wigeons that were feeding near the shoreline, two Gadwall in the estuary swam slowly away from us. We heard two Pileated Woodpecker calling close by and then we watched as they flew over the river giving us a quick view. We saw a Bewick's Wren and a Fox Sparrow in a low bush near the viewing tower. A Cooper's Hawk was perched in a low bush and there were Golden-crowned Sparrows in the nearby bushes. Two flocks of busy Bushtits and a flock of Golden-crowned Kinglets flew by us in some low bushes next to the trail. We saw a large number of Bald Eagles and Northern Flickers perched in the trees throughout the walk. 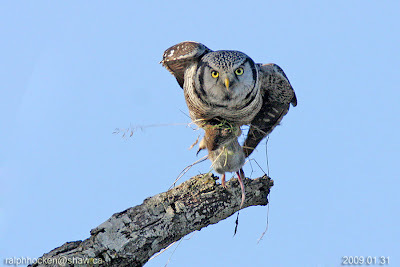 Northern Hawk Owl at Morden Road: Ralph Hocken Photo. The Northern Hawk Owl along the Morden Road in south Nanaimo has been seen everyday since Saturday January 24, 2009 and is still in this same area today. The Sunday bird walk went to Neck Point Park in Nanaimo. On a very windy winter stormy morning eleven hardy birders found the following twenty-six species of birds: Horned Grebe, Double-crested Cormorant, Pelagic Cormorant, Mallard, Harlequin Duck, Bufflehead, Common Goldeneye, Red-breasted Merganser, Common Merganser, Bald Eagle, Black Oystercatcher, Spotted Sandpiper, Mew Gull, Glaucous-winged Gull, Northern Flicker, Northwestern Crow, Common Raven, American Robin, Varied Thrush, Chestnut-backed Chickadee, Winter Wren, Golden-crowned Kinglet, Spotted Towhee, Song Sparrow, Dark-eyed Junco and Pine Siskin. Nine California Quail, House Finch, Chest-backed Chickadees, Dark-eyed Juncos, Spotted Towhee and a partial albino American Robin were seen in the 1600 block of Bowen Road in Nanaimo. A collard Trumpeter Swan was spotted along Cowichan Bay Road in Duncan. A Snow Goose was spotted at Somenos Marsh in Duncan. A flock of Canada Geese, Trumpeter Swans and seven Killdeer.ere spotted at the Westhaven Farm off highway one and the Crofton exit. A Northern Harrier was spotted at the Nanaimo River Estuary in south Nanaimo. The Tuesday Bird Walk went to the Little Qualicum River Estuary. Seven birders saw and heard thirty-eight species of birds. The winds were brisk, the surf was up and rolling into shore and there were some snow flurries through-out the morning. The highlights of the morning included the sighting of six Trumpeter Swans and four Great Blue Herons resting in the estuary when we arrived. Two Common Murres raced down the Strait of Georgia just above the water . There were large flocks of Greater Scaup, Harlequin Ducks, Surf Scoters, White-winged Scoters, Black Scoters and Bufflehead not far from shore. 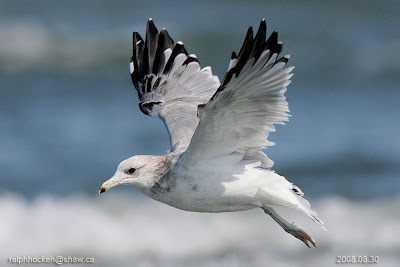 We saw several species of Gulls including hundreds of Mew Gulls, a Ring-billed Gull, fifty Thayer's Gulls, six Western Gulls, hundreds of Glaucous-winged Gulls and two Glaucous Gulls. Further offshore we spotted a Red-throated Loon, four Pacific Loons, three Horned Grebes, a Red-necked Grebe and a Brandt's Cormorant riding the strong waves. We spotted a Red-tailed Hawk perched on a tall tree across the estuary. Seven birders found the following thirty-eight species of birds. Green-winged Teal, Greater Scaup, Harlequin Duck, Surf Scoter, White-winged Scoter, Black Scoter, Bufflehead, Common Goldeneye, Common Merganser, Red-breasted Merganser, Red-throated Loon, Pacific Loon, Horned Grebe, Red-necked Grebe, Brandt's Cormorant, Great Blue Heron, Bald Eagle, Red-tailed Hawk, Killdeer, Black Oystercatcher, Black Turnstone, Mew Gull, Ring-billed Gull, Thayer's Gull, Western Gull, Glaucous-winged Gull, Glaucous Gull, Common Murre, Northern Flicker, Northwestern Crow, Golden-crowned Kinglet, Song Sparrow and Dark-eyed Junco. A Male Eurasian Wigeon was seen with over seventy American Wigeon at the Parksville Community Park in Parksville. "Rare bird alert- Northern Hawk Owl"
A Northern Hawk Owl has been spotted along Morden Road in south Nanaimo. The owl is a rare sighting on Vancouver Island, however can be seen east and north of the interior of British Columbia, as well as across the rest of Canada. A Red-breasted Sapsucker, a Downy Woodpecker and Northern Flickers were seen along Vista View Crescent in the Rocky Point area of Nanaimo. An Anna's Hummingbird is visiting feeders in the 7200 block of Aulds Road in Nanaimo. A Peregrine Falcon was seen in the 1600 block of Brierly Hill in Nanaimo. Eight Steller's Jays, six Varied Thrush, Song Sparrows, Chestnut-backed Chickadees, Dark-eyed Juncos and a Pileated Woodpeckers are visiting feeders along Pheasant Terrace in the Diver Lake area of Nanaimo. A sharp-shinned hawk landed on a window awning in the pre-100 block of Prideaux Street, near the Millstone River in Nanaimo. Guess speaker Gary Kaiser will present a programme on the Marbled Murrelet. Monday January 26, 2009 @ 7:30 pm. The Tuesday Bird Walk on February 03, 2009 will be going to the Shelly Road side of the Englishman River Estuary in Parksville. Or meet at the end of Shelly Road on the oceanside of Highway 19A at about 9:10 A.M. The Sunday Bird Walk on February 08, 2009, will be going to Nanoose Bay. Meet at the Bird Store at 9:00 A.M. or meet behind the Church camp off highway 19 and Arlington Road at about 9:20A.M.